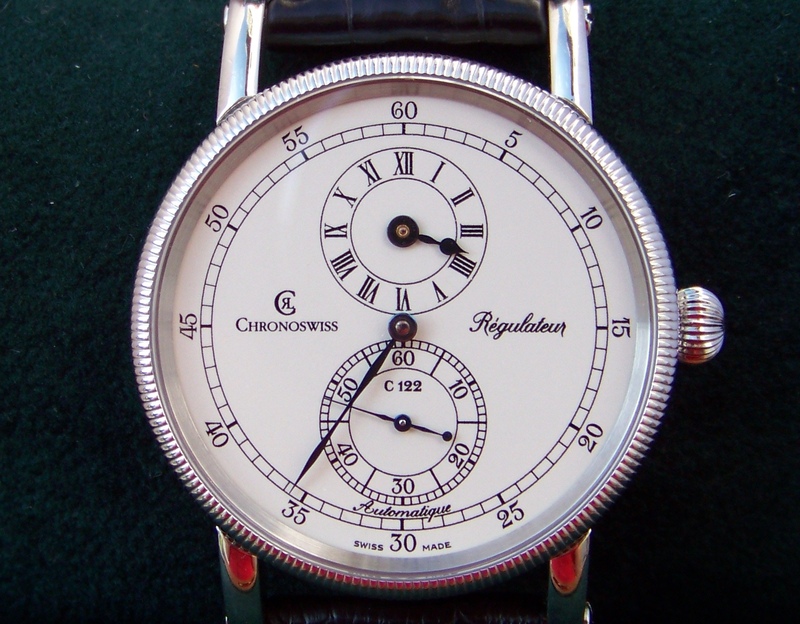 Chronoswiss, founded by Gerd-Rüdiger Lang in 1983, is a mechanical watch manufacturer currently based out of Lucerne. Mr. Lang spent several years leaning his trade as an apprentice before finding employment with Heuer (now TAG-Heuer) where he would work with chronographs for approximately 15 years. Quartz movements came to dominate in the 1980s prompting Mr. Lang to seek opportunity elsewhere. 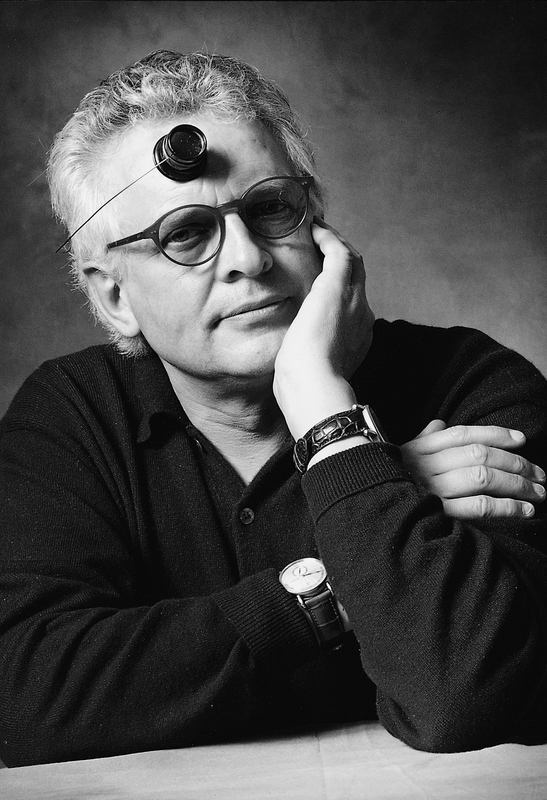 After his departure, he attended school in Würzburg and graduated as a “Master Watchmaker.” Shortly thereafter, he founded his own company which specialized in mechanical watches during a time when quartz was all the rage. It wasn’t until 1987 that the “Régulateur,” a hand-wound wristwatch, was born. It was touted as the first serially manufactured wristwatch with a regulator-type dial. It is the characteristics of this watch that would go on to define the company’s iconic style. Those features include a screwed and channeled bezel, an onion-shaped crown, and screwed strap lugs. While not as historically rich as many of the traditional brands, the Régulateur would help cement Chronoswiss’s place in horology. The year 2002 marked twenty years of watch manufacturing under the Chronoswiss name for Mr. Lang. To commemorate that milestone, he turned to Pelikan. 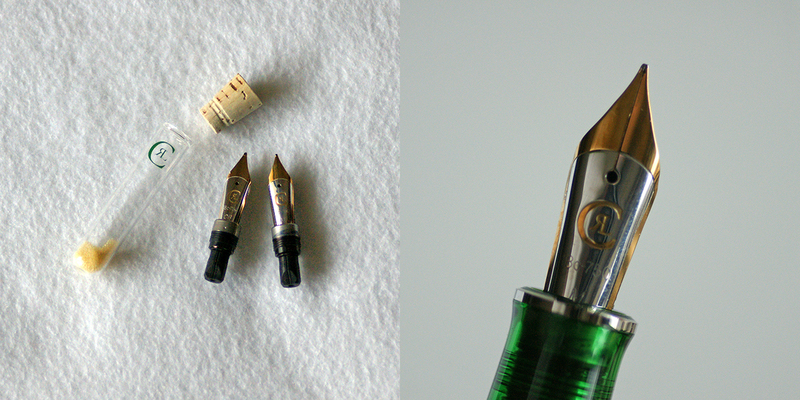 It is well documented that Mr. Lang loved Pelikan fountain pens. Literature that accompanies the pen indicates that the company produced about 7000 time pieces annually and that he signed each certificate by hand with a Pelikan M800 green demonstrator which was one of Pelikan’s very first special editions released for the U.S. market in 1992. It seems a natural fit then that he would commission a limited edition pen based on this design to mark his company’s anniversary. That model would carry the moniker Styloscope. Built off of the M800 chassis, the Styloscope was a numbered, limited edition of just 999 pieces which was not sold by Pelikan. 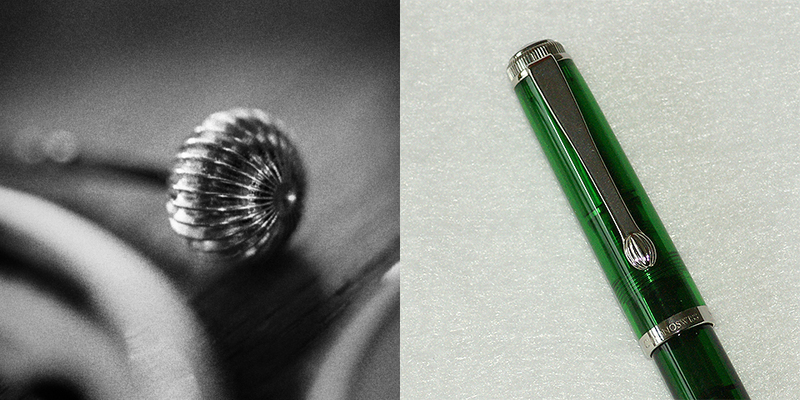 The Styloscope is a dark green transparent demonstrator, several shades darker than the M800 which Mr. Lang was so fond of. Sterling silver furniture and unique styling round out the pen’s appearance. The end of the clip recalls the onion-shaped crown and the trim ring at the piston knob and the cap top are reminiscent of the screwed and channeled bezel that make up Chronoswiss’s iconic styling. The cap top features the Chronoswiss logo in sterling silver. In fact, nowhere on the pen will you find any of Pelikan’s branding. The cap band is inscribed “Chronoswiss Ag 925 Germany.” The end of the piston knob depicts the pen’s individual number which matches the accompanying documentation. Included with each purchase were two 18C-750 two-toned nibs in sizes M and OB. Both are uniquely styled and bear the Chronoswiss logo. 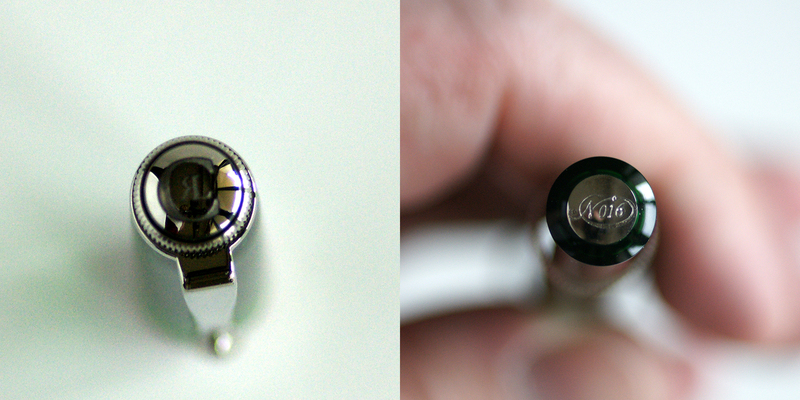 Because the Styloscope is modeled on the M800, it can accommodate any M8xx nib. 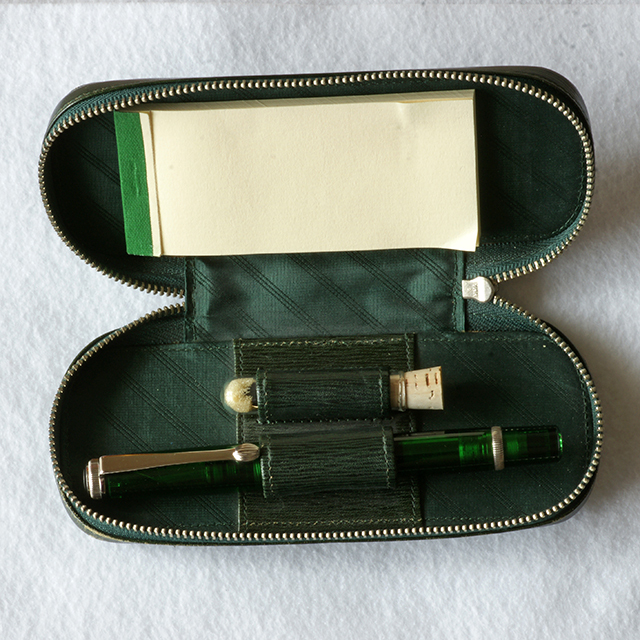 Packaging includes a green outer box which houses a traditional zippered pouch based on the Pelikan etuis of the 1930s & 50s and is designed to hold the pen, note pad, and spare nib. The aforementioned note pad and a numbered guarantee (versions of which have been seen printed in English and German) round out the included offerings. Each pen came with a 5 year warranty from the date of purchase. A rollerball prototype in the same style was also made in sample quantities but the company decided to not bring those to market making them an exceedingly rare and expensive find. Fifteen years after its release, the Styloscope can be difficult to find as their sales were split amongst both pen and watch aficionados. Chronoswiss still thrives as a manufacturer of fine watches but I should note that Mr. Lang no longer owns the company, having transferred ownership to the Swiss entrepreneurial family Ebstein in 2012. Left to right: a) Chronoswiss Régulateur wrist watch with channeled bezel. b) Styloscope clip nut. c) Styloscope piston knob trim ring. Left to right: a) Onion-shaped crown. b) Styloscope clip depicting the onion-shaped crown. Left to right: a) Both OB and M nibs were included with the Styloscope, the extra provided in a stoppered vial. b) Close-up of a medium Styloscope nib. Left to right: a) Cap top with the Chronoswiss logo. b) Piston knob with the engraved edition number of the pen. Zippered Etui that accompanied the Pelikan Chronoswiss Styloscope. Space for a note pad, pen, and storage for the extra nib was provided. Note: The quotations in green were excerpted from the booklet accompanying each pen. Click on any of the above photos to enlarge. Nice background on one of Pelikan’s most beautiful pens. That dark green is stunning, especially with the sterling hardware. 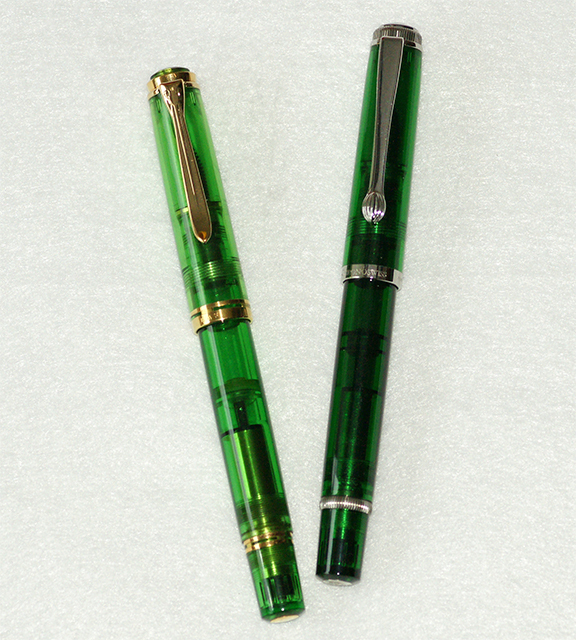 I have one other set that I picked up in Japan of four pieces in the “200” size that consists of the FP, RB, BP, and MP that are in that same clear dark green demonstrator.I have never seen another set or individual writing instrument, although I imagine there have to be more. I have two questions. One is a silly rumor that persists and I wonder if you can track it down. It is rumored there is one more pen numbered 000, making a total of 1,000 and it was retained by Herr Lang. That would be a great one to have, wouldn’t it? And great pen trivia, eh? I did ask some experts when I was at the Hamburg show. If Regina Martini and Jürgen Ditmer, the Pelikan Archivist, do not know, what hope do we have? The other thing that puzzles me is why the booklet says the second nib is OB. I have four of the Chronoswiss pens numbered 037, 097, 231, and 252. In each of them, the nib in the pen is M and the second nib in the vial is marked B. Under examination with a loupe, they really are B grinds, definitely not an oblique of any kind. Why do you suppose that is? And, if you look at the type font in the small booklet, the “O” looks like a zero “0” and an after thought. Any opinion on that, Joshua? Keep these wonderful Pelikan stories coming, please. Thank you for your comments Tom. I don’t thing anyone other than Mr. Lang himself could substantiate the existence of ‘000’ at this point. I have Styloscope #016 and am very excited for such a low number. Probably as close as I’ll ever get to 000. As far as the nibs are concerned, I too have seen extra nibs included with the Styloscope marked only as B. Consistent with the booklet however, my nib is marked OB. I’m not sure why the variation and how much of each type are out there but since these nibs are so very unique, this must have been intended. Here to we’ll probably never know the reason. Nice review of a gorgeous pen. I have had my eye on one of these for a little while and finally got one, which I received today – I love it. Curiously mine is #61, same two numbers as yours but in reverse order. The nibs that came with it are M and B. Thanks Luiz. 61 is a good, low number. Congrats on the new acquisition! I have not inked mine yet but I was thinking about 4001 Dark Green for starters. You’re most welcome. It’s neat that you got to meet Mr. Lang and have him sign your warranty card. It certainly adds a bit of prestige to such a nice pen. Any interest and how much. You should look to sites like eBay, Fountain Pen Network, and FP Geeks if you’re looking to sell your Styloscope. These are difficult to put a price on because they come up for sale so infrequently. Good luck trying to find a new owner for what is a truly neat pen. Have you got a price for the chronoswiss peli already? I don’t want to do commerce on Joshua’s excellent site; please contact me offline. I have several of these beautiful pens, although my nib pairs are all B and M.
I have been a collector for 51 years (shortly after the world transitioned from stone tablets and chisels), and the last two an authorized Pelikan dealer, The Pen Man http://www.thepenman.net. Thanks for keeping commerce off the site Tom but I recommend any one interested head over to your site if interested in a potential sale from a reliable retailer. I can vouch for and suggest that you contact Tom as he is a reliable retailer. Glad that you were able to find a buyer.